Bio: Indian artist Parag Borse, from the small village of Karjat, graduated with a BA in Fine Arts from the J. J. Institute of Applied Art, Mumbai in 2002. (The Sir Jamsetjee Jeejeebhoy School of Art is the oldest art institution in Mumbai, and is affiliated with the University of Mumbai. The school grants Bachelor's degrees in fine art and sculpture, and Master's degrees in fine art.) He derives inspiration for his realistic work from the beautiful natural surrounding around him. His rigorous efforts have brought him success in holding several painting exhibitions. Parag has had two solo exhibitions at Leela Kempenski, Andheri and he was invited to participate in the Art Fusion Show arranged by the Nehru Center, Worli. Parag has recently come to international attention by winning the Ruth Richeson Pastel Award in the 2013 Pastel 100 and having a feature article written around his award. He also was a finalist in the People and Figures competition in issue 90 of International Artist, April/May 2013. Quote: I feel the real bliss lies only in blankness. And it is only through blankness that the reality can be experienced. The moment we shed our prejudices, we have direct access to the reality. Above all, what matters, is the joyful moments that an artist experiences through portraying the reality on his canvas. Style: A very colourful representation of his subject matter. He takes great care with the tone and colour of his ground, often incorporating it into his finished work. Influences cited include Monet, Sargent, Bouguereau; and from the 20th and 21st centuries such diverse figures as Ken Howard and John Yardley, Richard Schmid, Scott Burdick and Morgan Weistling. Navigation: Trust the top links; there are apparent links along the bottom of some pages (e.g. Philosophy) that lead nowhere. There are also some random blind links in the text. Gallery: Galleries 1 through 5 include paintings in both oil and pastel. Image View: Images are viewed in a window and may be scrolled and saved. Information is provided on medium and dimension. Wrinkles and the Rooster is 31 x 27 ins, 343 x 400, 131 KB. 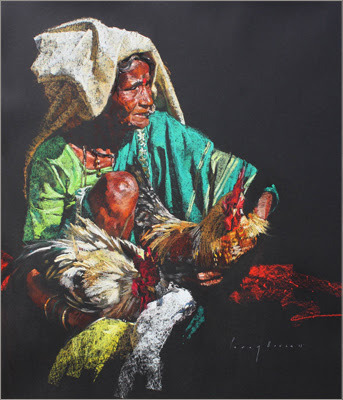 In his interview with the Pastel Journal, April 2013, Parag describes the genesis of this painting: Passing through the market…he was touched by the prospect that the woman might have raised – and loved – the bird, but found herself forced to sell it for food. “It seemed that her intense poverty had rendered her helpless…apart from the beauty of the scene, I was touched and moved by the harsh reality of her life.” Now take another look at the painting!